It’s all on me; by which I mean that I keep warning you all to stay vigilant, mind your manners, play by the rules, take a whistle, take water, take food, watch where you step, take a buddy, stay safe and what do I do? It’s a long story. A couple of retired UNM and state water guys and a photographer wanted to go see a place where water and water wars had really meant something and where the place is still worth a project or two. 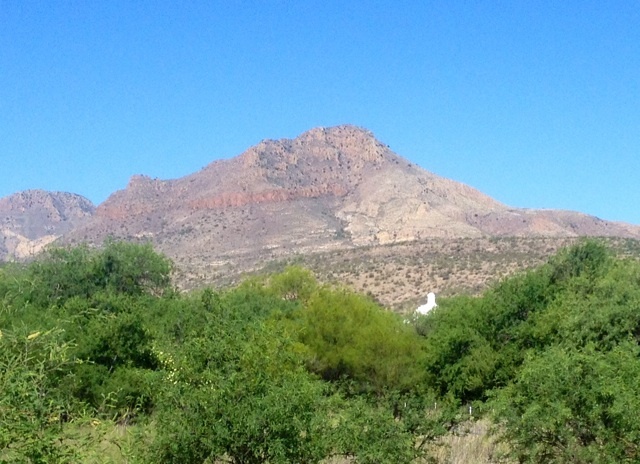 So we went to the Rio Puerco and Cabezon—a surreal place with volcanic plugs, salt water rivers, artesian wells, limestone blocks, and ghost towns. And then I broke my leg. When I stepped on it, it sent me flying down 30%-40% slopes pretending I was a slinky. I would go head first, make a pile then feet first and make a pile. During one of those feet first stops my right foot felt the need to take a potty break in a crack it had slipped into but the rest of me kept going. Thing was the steps were six feet deep rather than the six inches of normal slinky things. I wound up about 40 feet down the slope. Pete quickly found a couple of blankets and a pillow in his car and threw them and some water down to Jim who was just getting to me. He then took off down the road in his car to find a signal, and Henry stayed up on the road in case anybody with any sense came by. About 40 minutes later the HOTSHOT crew from Jemez Pueblo showed up and then the Zia Pueblo crew came in about five minutes later. I need to tell you about these guys but not right now. A couple guys came down; they stabilized the leg, made sure they had my insurance card number (kidding) and with ropes, sleds, neck braces, belts, and grunts I was out of there in about an hour, most of which was a physical: You hurt? Yes. Where? Lower right leg, left shoulder. Move your fingers? Yes. Move your toes? Yes. Pain in back? No. Need to throw up? No. Hit your head? No. Bleeding? No. He called up for what looked like a sturdy sided shoebox,ripped enough of the side for my foot to fit inside and then called for another box to fit my entire leg into; he taped them shut; called for a light litter which they tucked under me; called for a sled, a neck brace, a companion and a rope; they put the neck brace on, lifted me into the sled, belted me in, tied the rope to the front end and started to pull me out. The Zia and Jemez pueblos neighbor one another and the jokes were flying back and forth as if they were neighbors. Some sixty years ago I hooked up with a Zia HOTSHOT crew on a fire behind Los Alamos. I learned more about fighting fires in one day than in all the other fire fighting courses I’ve had since. I asked the fellow at the head of the litter when we reached the ambulance how I could tell them apart to thank them; without taking an added breath he said the Zias were the short ones. I love those guys. Don’t know what this all means. So far its been one tibia, one fibula, two steel plates, 18 screws, 42 stitches and some real nice conversations with the nighttime nurses in the UNM teaching Hospital. The docs say it will be a long one, putting more and more weight on it as time passes and maybe a few hours a day with a cane by mid February. There is something weird going on in nursing in that they can’t be nurses anymore: no pats on the arm; no rub of the shoulder—has to do with lawyers and harrassment. But not for Rosa Pokey, the strong boned, 50ish, Navajo nurse who gave me my nighttime feel good shots. A slight smile showed on her face when she noticed I was watching; when she finished, she patted the back of my hand—an acknowledgment that I was human, that she knew I hurt, that she was there if I needed her. She closed the curtains, lowered the lights and left a small crack in the door as she went on to other duties. I love those people. “Rappel – to descend (as from a cliff) by sliding down a rope passed under one thigh, across the body, and over the opposite shoulder or through a special friction device.” Merriam-Webster’s Collegiate Dictionary. In the last post I presented the travails of Darrell Seyler as told by Peter Frick-Wright in the September 2015 issue of Outside magazine where Darrell was absolutely certain that Forrest Fenn’s treasure was in a small cave up the side of a cliff in Yellowstone National Park. Getting to that cave was a problem in that the easiest, if not the only, way was to rappel down from above. After a few failed tries by Mr. Seyler and a friend, neither of whom, having never read the dictionary, knew anything of how to rappel except that it required a rope (which they had bought in a local hardware store). These attempts were what occasioned one of the “lost it” episodes mentioned by Mr. Frick-Wright: he had followed Mr. Seyler through the snow and found him with his head against a rock and his new rope tangled in his snowshoes, crying. On a far different scale is the 65’ rappel made by Aron Ralston in 2003. Mr. Ralston, you will remember, went alone into one of Utah’s most famous slot canyons, scrambled over a near 1000 pound chock stone which dislodged, rolled a bit, and pinned his hand to the canyon wall. After a week or so trapped in which he lost 40 pounds, he decided that the only way to keep from dying in that lonely place was to cut off his own forearm, which he did with a dull knife and a twist of the arm to break the bones. He then hiked down the canyon, which ended in the now famous 65’ rappel that he made, mind you, with a recently severed arm, more than a week of little sleep, nothing to eat, and nothing to drink except his own urine. My friends and I had decided that what we needed was a course in rock climbing so we went off to the nearest army surplus store where I bought a parka-like jacket that formerly belonged to the 10th Mountain Corps, a climbing rope, and several pitons and carabiners, parts of which I still have. What I remember of the course some 55 years later, is the final exam: a day-long trip to climb the “Maiden”—an awkward looking thumb of rock that juts out from the flatirons south of Boulder, Colorado. The climb we made consists of seven “technical” pitches between 5.0 and 5.6 difficulty—not all that bad except that things can get a bit “airey” by which I mean, it is best to keep nose to rock and not look down to keep from getting jumpy leg—a sure sign that you are about to peel off. If you look at the photo, the first pitch is to get to where that fellow is standing (about a third of the way up on the left); the second goes down to the bottom of the notch (center, bottom) known as the “Crow’s Nest” (we renamed it “First Bounce”); the third and fourth pitches (yellow)take you around to the left and back and up the north face; and the fifth is on the east face which will get you to the top. The way back down is a whole lot more interesting: a 120’ free rappel which leaves you at the end of your rope and just to the right of the “First Bounce” so that you need to get enough of a pendulum swing going to get you over to where you belong. Then you retrieve your rope, hook up again and take off to the right in another 120’ “normal” rappel that gets you to the base. Now, Boulder is a super fit, outdoorsy city which means that the “Maiden” is climbed by hundreds of people every year and I have little doubt that some of them could do all of it during a coffee break. It took me a bit longer. The climb itself was a piece of cake; after all, I had just spent a couple of years in the army doing pushups. Getting down from that young lady, however, was something else altogether. It goes like this. When it is your turn to come off the top you get into your harness, snap your rope through a carabiner hooked to your harness, and attach your rope to a piece of hardware that has been there, like, forever. Trying to pay no attention to all the talk from your friends about “First Bounce,” you back off the thing until your feet dangle in the air and you are good to go. Except I didn’t. I hung there unable to go up or down because in all that excitement my new rope had picked up the tail of my new parka and pulled it through my new carabiner where it got stuck. So I hung there while my friends on top argued over what to do. They decided to send down a knife and then they argued over whose knife was to be sent down because it had to be the sharpest but this argument moved into a 10 minute discussion of the best way to sharpen a knife. Then, miracle of miracles, an open Swiss Army Knife dangling from a rope appeared in front of my face. But I didn’t have a free hand to use it since one hand hung onto the rope in front of me to keep me from tipping over backward and the other was responsible for keeping the right amount of rope on back friction that would eventually allow me to continue. This dilemma was then discussed by my friends on top while I enjoyed the magnificent view one has from where I was sitting. They decided that even though I was right handed (the one adjusting the rope/back friction), I should slowly release my death grip on the rope in front of me, slide my wrist and then my forearm across the rope so that tension would be maintained, then hook my elbow around the rope, grab the knife with my now free left hand and dock the tail off my new parka. went on my merry way. I reached “First Bounce,” did the pendulum thing, landed upright, retrieved my rope, hooked it to another bolt some nice people had provided and backed off to the next 120’ rappel—the easiest and most enjoyable rappel I have ever made. Back in town they made me buy the beer. Remind me if you have heard this one before: Tell a resonably sound and attentave friend just where it is you are going and when you will get back. Take a damn whistle! Do it wrong and you buy the beer. Forrest Fenn didn’t do no rappell to hide gold and jewelry just so you could buy beer either. Aron Roylston. 2004. Between a Rock and a Hard Place. Simon and Schuster. Peter Frick-Wright. 2015. “Casch X Money.” Outside September. Over the weekend, a friend loaned me his copy of the September 2015 Outside magazine thinking that I would be interested in the article, “Cache X Money” by Peter Frick-Wright. I was. The article is about an ex-cop living in Seattle named Darrell Seyler who made 17 trips from Seattle to Yellowstone and back over 17months because he knew exactly where Forrest Fenn had cached a fortune. He was just going over to pick it up. For those of you who want to compare, Mr. Seyler drove nearly 20,000 miles mostly at night and often through winter and spring snowstorms. In those 17 months he used most, if not all, of his savings, nearly drowned trying to cross the Lamar River, spent the night freezing wet, and was picked up by search and rescue the next day. Then on a subsequent trip he made it across but didn’t make it back, spent another freezing wet night, and was once more picked up by search and rescue. This time, however, he went to jail for a few days and was fined $6000 to be paid in installments. Then, because he often showed up late for work after a weekend trip, he lost his job, got behind on his payments, and is now next to homeless. Mr. Frick-Wright, who sometimes accompanied Mr. Seyler, mentions at least three times when Mr. Seyler “lost it” after it turned out that the treasure was not where he was absolutely certain he had seen it either in a photograph or from a short but near impassable distance. Obviously Mr. Seyler’s experience amounts to a whole lot of “thrill” for a “chase” that has left him with little but a few new acquaintances among the authorities in Yellowstone. But, while an extreme case, he is not the only legend out looking for Mr. Fenn’s treasure. After nearly five years of writing this blog, I have come to know some of these legends and find them all (well, most) to be honest and unassuming people with interesting stories to tell. In many ways, they have taken on the personality of Mr. Fenn himself except that they tend to be more “dreamer” than “pragmatist.” And, without Mr. Fenn’s pragmatism, dreamers will find zilch. I, of course, have nothing against dreamers, dreams or dreaming. I personally have tubes of paint and empty canvases stashed away somewhere and every time my lovely wife and I stroll through the art galleries of Santa Fe, I say to myself, “I can do that,”—but I can’t. For me, art was never an objective; it was only a dream. “A plan?” you say. “Yes,” say I, and it better be a good one. And I don’t mean one that will just lead you to the treasure. I mean one that will keep you out of trouble as well. According to Mr. Fenn, 30,000 searchers have been out looking over the last four plus years, and although nobody has yet found the treasure, a good many have gotten into trouble while out there looking. Preparation of a good plan is needed because the process of making a good plan castigates you when you’re thinking is muddled, when it is founded on false assumptions and when your stated goals are mutually exclusive. It yanks you, dreamer that you are, back to reality. So, if, for some reason, planning gives you the hives or the hiccups so bad that you shy away from the word “plan,” you are in for even worse suffering from what is known in the trade as the “Carnousti Effect.” Look it up. Frick-Wright, Peter. 2015. “Cache X Money.” Outside. September. Pages 76-82,111. As many of you know, I love maps, and one that recently caught my attention was this one of the North American deserts; the mapmaker’s depiction of Idaho is especially fine. There are, of course, a great many other maps that far better represent the western part of the U.S. and the northern portion of Mexico in that they have a lot more detail, straighter lines, a sense of proportion, and most of them do not allow Kansas to claim the lower fourth of Nebraska. But to be successful, a map needs only to show what you are interested in and this one does that, by which I mean my interest is in the area just north of the short black line that cuts across the finger between the Sonoran and the Chihuahuan deserts. Not only is that where Tumacácori National Historical Park (TNHP) is located, it is also the place where all kinds of other interesting things happen. For example, it is northern limit for you to hear the mournful cries of the grey hawk, see the brilliant hues of the elegant trogon, and catch the hoots of two different owl species that only make it that far north by going right up that narrow swath of olive drab. 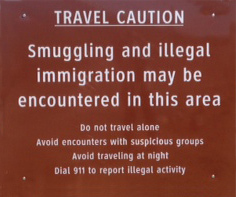 It is also one of three routes in Arizona preferred by migrating neo-tropical songbirds as well as by migrating neo-tropical job seekers and two-legged mules. 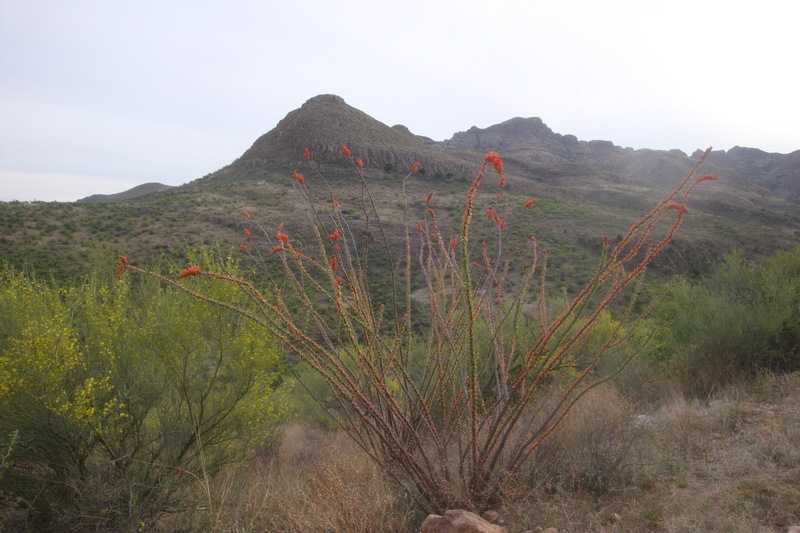 With important exceptions, many of the same plant and animal species occur in both the Sonoran and Chihuahuan deserts, (i.e. any living thing that has thorns, stickers, stingers, fangs or is called a “cactus” pretty much grows in both deserts as well as in that skinny area between the two which, for very obvious reasons, is called “THORN-scrub.”) The THORN-scrub exists because it is relatively more frost-free and a bit more moist than are its two neighbors and this allows species from further south to hang on in certain protected spots. It is a fascinating place to spend the winter. It is also where I found the treasure I was looking for. Now, saying, “I found the treasure. . .” could be a bit of a problem given that this blog is about Forrest Fenn’s hidden treasure chest and some of you may even now be abusing your favorite cuss-word. But I am talking about something else. I’m talking about the northernmost population of Capsicum annuum L. var. glabriusculum; the native chiltepin; the wild ancestor of all American chili peppers; the pea-size fruit that hits “max” on any scale of hotness you want to talk about. And, there is a population of it somewhere in that THORN-scrub just across the road from the Tumacácori National Historical Park. I wanted to find it. But chasing the wild chiltepin is not unlike chasing after Forrest Fenn’s treasure except there are people who know where this population is. They just don’t want to tell you. You see, the wild chiltepin is a very expensive thing to eat (up to $70/pound) and efforts to grow it commercially most always fail. Thus, populations of wild chiltepin are like populations of wild edible mushrooms—those who know where they are just ain’t gonna say. Armed with its botanical description (that pretty much describes a number of other of the THORN-scrubs in the area)  the search began. 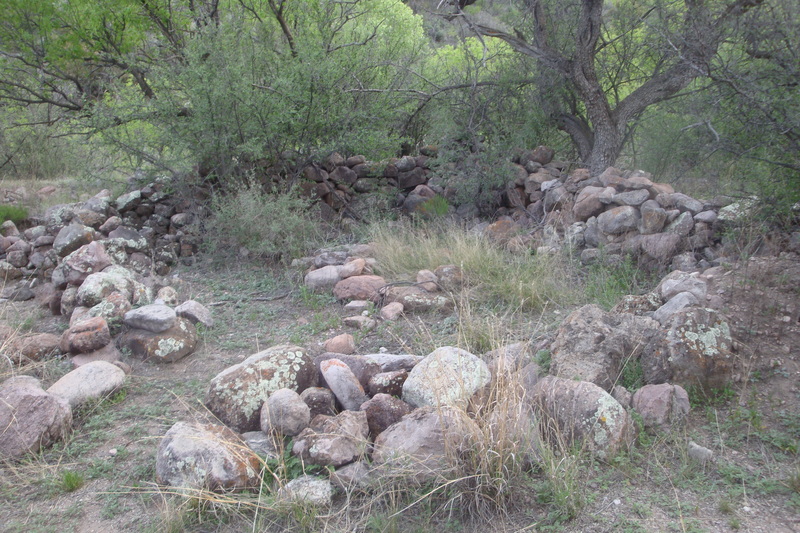 I found the rock corrals fairly quickly just a few miles up the arroyo that empties into the Santa Cruz River a quarter mile south of TNHP, but there was nothing that could be called a chiltepin. 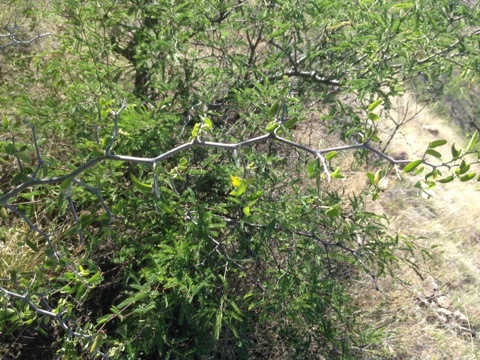 A couple of other scientific papers said the chiltepin grow under “nurse trees” of desert hackberry and wolfberry. One of the papers even gave coordinates for the study area where the chiltepin were growing. They gave the coordinates in “degrees” and “minutes” but no “seconds” just to confuse anyone who might want to go find them. The scientific papers further said that the plant is drought deciduous and dies back with heavy frost. I also found out that the stem architecture of the chiltepin is a pronounced zig-zag. I went to see Gloria. Gloria is an 83 year-old Mayo/Yaqui lady from Nogales, Mexico who sometimes is the tortilla maker for the tourists at TNHP. She likes me because I listen to her sermons and her poetry, and applaud when she sings me the rancheras she has composed. She puts an extra scoop of refried beans on my tortilla. Then, the strangest thing: little bags of chiltepin started showing up on our Casita doorstep. Evidently, everybody had decided that I wanted to eat them when all I wanted to do was to see the beast in its native habitat. Having been skunked on three tries already, I decided to use what the old ecology professor had told me and “just go up there with no objective other than to enjoy the place” (Mountainwalk.org/Waterholes and Single’s Bars-July 19, 2012). So I filled my camelback with water, stuck a few caffeine-laced candies in my pocket, put a whistle in my day-pack, donned a hat and took off. It was beautiful. I followed game trails and scared up a family of javalina. Dead-ends were the norm and bushwhacking a common strategy. 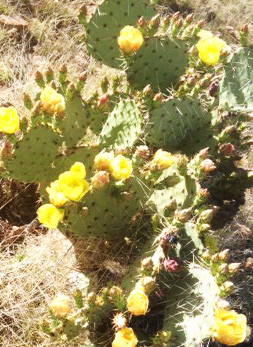 After a couple of miles I topped out on a ridge about an eighth of the way up the front of Tumacácori Peak and walked up the ridgeline until I hit about an acre of giant prickly-pear cactus, all of them in bloom. Since cactus-whacking didn’t look all that appealing, I turned to go back down into the canyon and saw some small bushes growing under a desert hackberry. The bushes had zig-zaggy branches and way back in there were a couple of pea-sized fruits that the birds had missed. 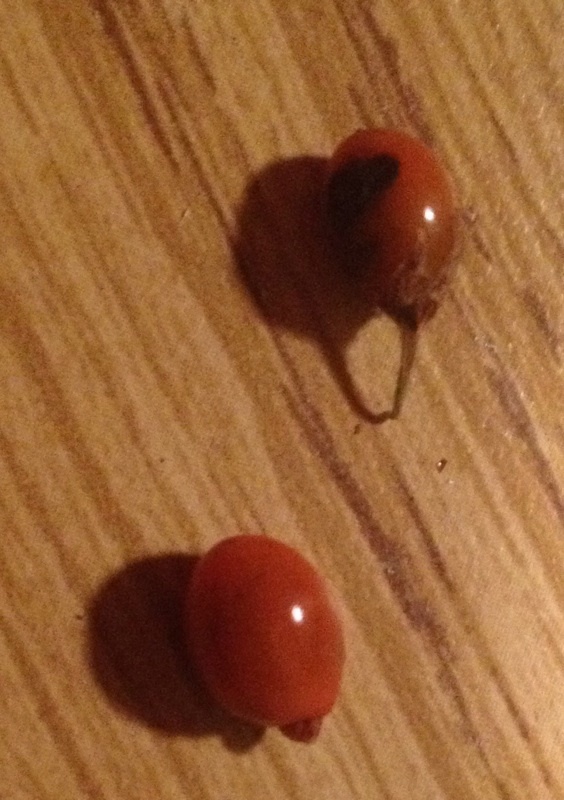 I reached in, pulled one of the slightly reddish-orange thingies off its parking place, and crushed it between my thumb and finger; seeds went flying everywhere. I put said thumb in my mouth and immediately went to my water. There is no mistaking the wild chiltipin, the mother of all American chili peppers, the hottest thing not a red-hot poker you will ever put in your mouth. It was wonderful. I found two more fruits on a nearby bush, put them in my pocket, and with a really big grin, started back toward the pickup. Now, you may be curious as to where I was. That’s good. I would want to know myself if I were you. But, I ain’t gonna say. Nabhan, Gary Paul. 1985. Gathering the Desert. University of Arizona Press. Tucson. 123-33. Arizona Game and Fish Department. 1991. Capsicum annuum var. glabriusculum. Unpublished abstract compiled and edited by the Heritage Data Management System, Arizona Game and Fish Department, Phoenix, AZ. 3pp. I dare say that those of you who don’t like history don’t like history because of all the names, titles and dates that come with it. For example, Mr. Chini was born Eusebius Francis Chini in 1654 in Central Europe which at that time was called the Holy Roman Empire. And, as you will recall from your high school cheat sheet, it, by which I mean the Holy Roman Empire, consisted of many countries, cities, states, city states, counties, castles, highlands, lowlands, clans and religions, all of which passed the time by playing “Game of War,” the object of which was to defeat your elder brother. Of course, all of this gaming needed people in charge and people not in charge each of whom required a title and, therefore, we have, in no paricular order, “emperor,” “pope,” “priest,” “prince elector,” “lord,” “knight,” “duke,” minor and major “counts,” “bishop,” “archbishop,” “prince,” “abbot,” “prince abbot,” “elder,” “master,” “marques,” “friar,” “vasel,” “peasant,” “padre,” “bro,” “cuate,” “hermano” and “king” of which there were many. The ladies, of course, also had titles, one of which was “lady,” but we will not go there. Suffice it to say that they also played “Game of War” and though few had the “moxies” of Kate Upton, they played it very well. 1492 Columbus who, as you know, discovers America by which we mean that he rediscovers the Caribbean a few thousand years after several small groups of curious Koreans walked over to the “new” world just to see what was there. 1517 Friar Martin Luther places his 95 theses on the door of All Saints’ Church to protest the “nepotism, simony, usury, pluralism, and sale of indulgences” by any of the Church hiearchy ranked above friar. And thus began the Protestant Reformation. 1540 John Calvin continued the Protestant Reformation by accusing the Lutherans of “nepotism, simony, usury, pluralism, and sale of indulgences” and they, in turn, accused him of heresy. 1540 And, just to make history interesting, Antoine Saunier joins Antoine Froment in accusing the Calvinists of believing in baptism by sprinkle instead of baptism by dunk. The Calvinists accuse Antoine of stealing from the poor box. Most of the Sauniers, however, remain loyal to the Pope. 1691 On what is probably his only visit to the place, Padre Eusebio Francisco Kino SJ (aka Mr. Chini) arrives in Tumacácori to establish one of his early missions. Padre Kino labored in the fields of northern Mexico and southern Arizona for 20 years and established 24 missions, each with its farm and ranch enteprises and trade schools. 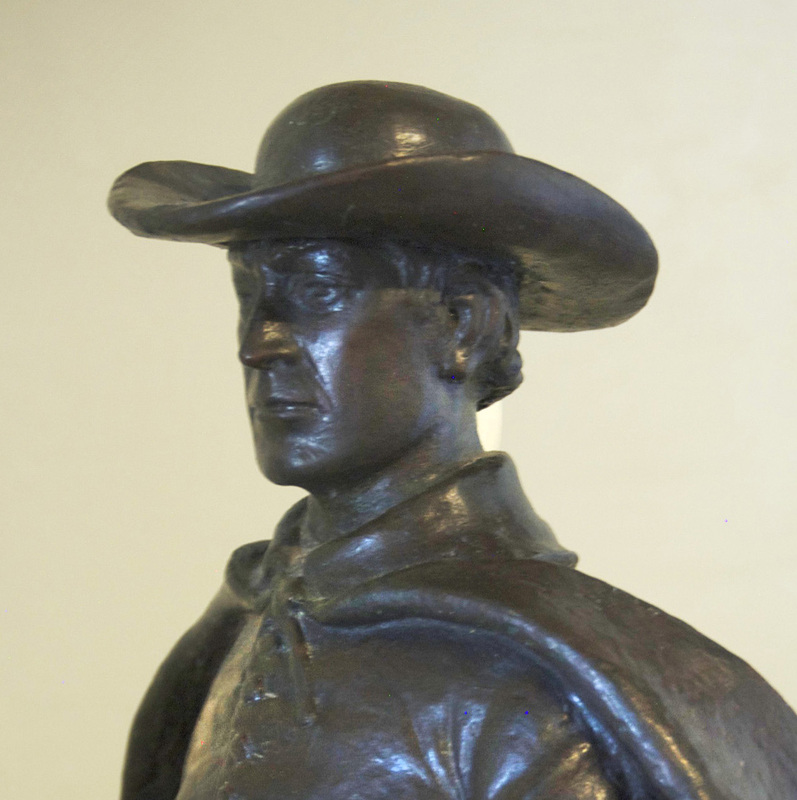 When he died in Magdalena, Mexico in 1711 he became a future binational hero; the friars who had been sent to the mission at Tumacácori, however, were still trying to figure out how to fund a church building program when in . . .
1767 The King of Spain decided that the really smart, supurbly organized, politically adept, and well resourced Jesuits were some kind of a threat; that is, they preferred to minister to the Indians than to the Spanish colonists which meant that their loyalties were to the Pope rather than to the King. He has them all arrested then force marched hundreds of miles to the sea for a long voyage back to Spain where the survivors were “cloistered” for the rest of their lives. However, the memory of the Jesuits lingers in the New World by which I mean the local folk still firmly believe that the Jesuits were very rich what with all those cows, farms, landed parents and dozens of plumbers and electricians paying union dues. 1768 Friars of the Franciscan Order take over the work of the Jesuits including the mission at Tumacácori and, in the spirit of true partisanship, begin to build a church that will outshine the dinky little ediface that the Jesuits had built. But, for lack of funding, it is all downhill from there for the Tumacácori Mission until . 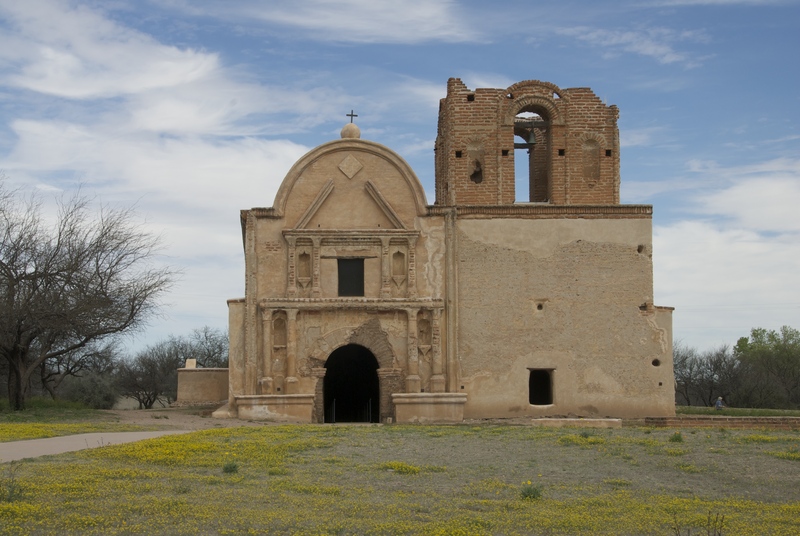 . .
1821 The succesful Mexican Revolution; so succesful that funding for the church building program at Tumacácori is renewed until Mexico evicts anyone not born there including a large number of the Franciscan missionaries. The church at Tumacácori is never finished—indeed, it seems to have gone backwards given a war with the United States, fights with the Apaches, an earthquake, floods, rain and other acts of God. Additional damage is caused by thieves who tear off the roof for the timber and take out walls and the floor looking for Jesuit treasures of gold and jewels but find only the remains of two unfortunate Franciscan friars buried there long after the Jesuits had left by which I mean the Jesuits had nothing to do with building the building that supposedly held the non-existant Jesuit riches. The moral of this story, of course, is that although you may not like it, you gotta think a bit about history before digging up all manner of sacred ground to find a treasure that was not buried there ever. Tumacácori is beautiful, the Tumacácori National Historical Park (TNHP) is awesome and the staff is great; but I’m still not allowed to give tours. Active searches for Forrest Fenn’s treasure chest seem to slow in late fall and stop altogether during winter—kind of the opposite of what the Mountain Men did. Beaver pelts reached their best quality during these periods and though the trappers had to hunker down during the heaviest snows and when temperatures in the mountains dropped to bone chilling levels, the work of trapping went on. And when outside activity was impossible, they stayed in their crudely built huts or in their buffalo skin tipis, told lies to one another and “philosophized.” So, since winter is here and my sweet wife is now deep into remodeling our 17’ long Casita (which we will take to Southern Arizona where we are volunteers at the Tumacacori National Historic Park), for the next couple of months this blog will do the same (by which I mean I also will tell lies and philosophize). Here goes. One of the topics that often comes up when people discuss the places they love is a concept called “Sense of Place.” You may not call it that, but I’ve no doubt that you have felt it. There are hundreds of writings out there that discuss the topic. Architects, land-use planners of various kinds, conservationists, deep ecologists, photographers and a sociologist or two, write most of them. Some of the writings are scholarly tomes, others are scientific studies and others are just downright beautiful descriptions of a specific place that, if read alone late at night, bring moist eyes and throat lumps. I had never really thought about that “fuzziness” thing until one day a friend and I were riding along in his old jeep station wagon with the observation deck on top somewhere between Rowe and Las Vegas (New Mexico). We were discussing a recent photography book that had a page or two on a sense of place and he asked me what I thought it meant. Fortunately, we were fast approaching the corner where we were to make a very important turn lest we wind up in Trementina rather than Watrous and the conversation died. That was a while ago and now that I have had time to think about it, I find the statement that, among other things, a sense of place has to do with “banter,” to be perfectly justifiable. You see, a solution to the fuzziness problem can be helped along if, instead of emphasizing “place,” as most writers do, you emphasize “sense,” as most don’t. Emphasizing “sense” rather than “place” takes you to what you feel and understand about a place rather than to what you see and think you know. It has to do as much with what is inside of you as it does with what is out there in front of you. If you can banter within that place, it says that you are comfortable there. You know enough about it to hold an intelligent conversation. You can make jokes with those with whom you trust and defend yourself when things get more serious. Likewise, you know enough of the culture and language to recognize the difference between a “tease” and an “insult.” But, in addition to its beauty, you know enough of the dangers of that place to be cautious but not afraid. And, you know where you are, even if you are lost.